Access uTorrent from any Android device. Torrents are the easiest way to download files in a much faster way that is peer-to-peer. Torrents are just a link which helps you to download files. They are the easiest source to download any movie, songs, software, games, ebooks or in other words I would say they can help you to share files promptly. The good news about uTorrent is that, you can now start all your downloads on your Android phones. Use of torrents was till now restricted to your desktop PC and laptops only. The uTorrent application is available on Google Play which can be downloaded and used the same way you use it in Desktop machine. 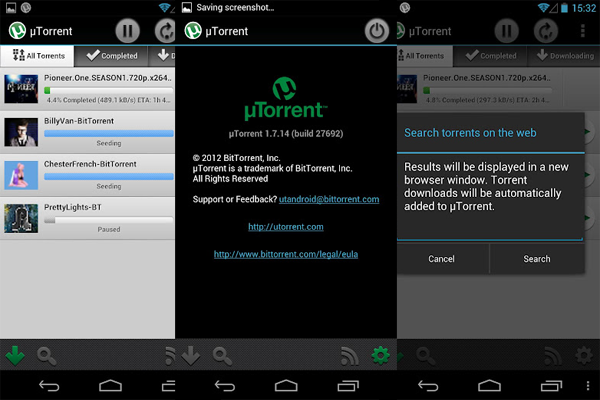 uTorrent application on Android makes stronger peer to peer network to download files. So wherever you go you can use and monitor all your torrent downloading files. The application is new in market it is very fast, lightweight and powerful to handle all your torrents in a small Android devices. It is faster and easy to use. No free speed or data transfer available while using this application, so be sure you do not spend too much for the data speed or data transfer. You can keep track on torrents with the help of RSS subscription. Stay connected with the upcoming updates available in the community. Related Post: Easy way to access blocked torrent sites! Tips to be noticed while using uTorrent application for Android. If you are using the uTorrent application for torrenting, you should make sure that it is not used to download large files if you are running a 3G or 4G connection with a limited usage plan. You will need to manage the seeding part otherwise it will boost up your uploads while the files have been downloaded. Remove the torrent file from the list once the downloading is complete to avoid seeding. Maximum usage of uTorrent app should be when you are connected to a Wi-fi network and close the application when you are away from Wi-fi. Try scheduling the downloads, if you know when you will be in a Wi-fi network like in office or meetings. Related Post: Download Torrents, videos and share media with your browser. I hope you enjoy torrenting from your Android device. Feel free to give us your experience and feedback by using this app. Click here to download the uTorrent applciation. « Better cloud storage options than Dropbox.